Cassiopeia A is a famous supernova remnant, the product of a gigantic explosion of a massive star about 350 years ago. Although discovered in radio observations 50 years ago, we now know that its emitted radiation spans from radio through high-energy gamma rays. It is also one of the few remnants for which the birth date and the type of supernova are known. It was a type IIb, the result of a core collapse supernova explosion. 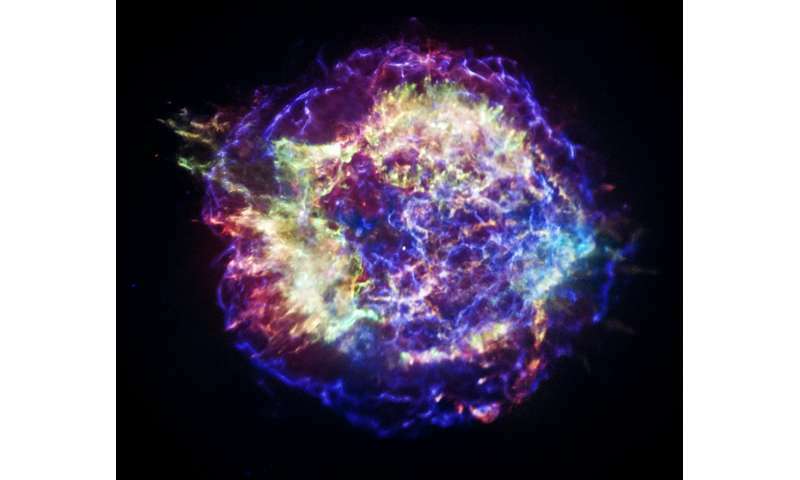 The precise knowledge of its nature makes Cassiopeia A one of the most interesting and investigated objects in the sky, and in particular, the study of its connection with cosmic rays, subatomic particles that fill the galaxy with energies higher than anything achievable in laboratories on Earth. The very high-energy part of the spectrum of Cassiopeia A results from cosmic rays (either electrons or protons) within the remnant. Until now, this range of energy could not be measured with sufficient precision to pinpoint its origin. Sensitive observations above 1 Tera-electronvolts (TeV) were required, but achieving them was daunting. 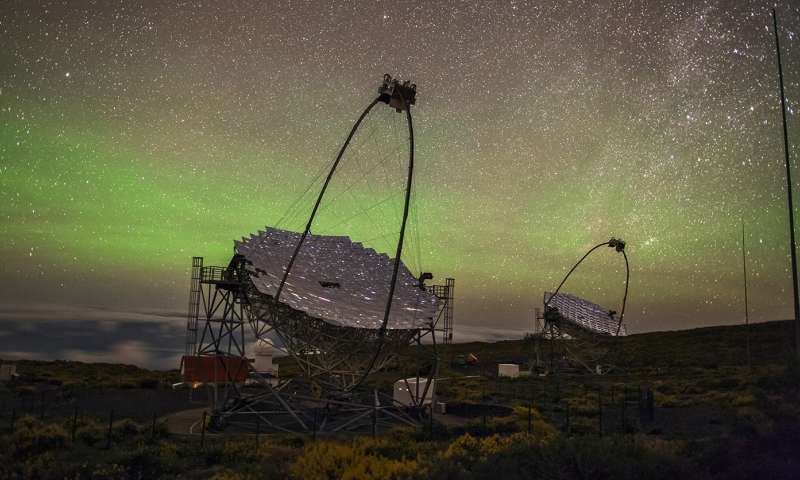 An international team led by scientists from the Institute for Space Sciences and collaborators has finally achieved such observations with the Major Atmospheric Gamma-ray Imaging Cherenkov (MAGIC) telescope. The researchers recorded more than 160 hours of data between December 2014 and October 2016, revealing that Cassiopeia A is an accelerator of massive particles, mostly hydrogen nuclei (protons). However, even when those particles are 100 times more energetic than those in artificial accelerators, their energy is not high enough to explain the cosmic rays that fill our galaxy. "Cassiopeia A is the perfect object to be a PeVatron, that is, an accelerator of particles up to PeV energies (1 PeV = 1.000 TeV). It is young, bright, with a shock wave expanding at great velocity and with very large magnetic fields that can accelerate cosmic rays to at least 100 or 200 teraelectronvolts," says Emma de Oña Wilhelmi, scientist of CSIC in the Institute for Space Sciences, "But contrary to what we expected, in Cassiopeia A, the particle energies do not reach more than a few tens of tera-electronvolts. At these energies, the radiation suddenly drops and the emission stops abruptly. Either the remnant cannot accelerate the particles to higher energies, which challenge our knowledge of shock acceleration, or maybe the fastest ones quickly escaped the shock, leaving only the slowest ones for us to observe," says Daniel Guberman, at the Institut de Fisica d"Altes Energies. "Those supernovae are natural accelerators of particles. Therefore, they are the perfect laboratory to study charged particles and plasma in conditions that are not possible in our labs in Earth," says Daniel Galindo at the University of Barcelona. "To understand the origin of the cosmic rays implies unveiling the origin of our own galaxy," concludes Razmik Mirzoyan, MAGIC spokesperson from the Max Planck Institute for Physics (MPP) in Munich (Germany). The MAGIC telescopes are located at the Roque de los Muchachos Observatory, in La Palma (Canary Islands). MAGIC, a system of two 17m diameter Cherenkov telescopes, is currently one of the three major imaging atmospheric Cherenkov instruments in the world. It is designed to detect photons tens of billions to tens of trillions times more energetic than visible light. MAGIC also uses a novel technique to reduce the effect of the moonlight in the camera, allowing for observations during moderated moonlight nights.